I went with black Home Depot milk crates (no logo). I zip-strapped two together to form a single unit. The holes allowed bungee cords to be passed through and clipped to the interior cargo hooks next to the seat backs. These hold everything I need (hand tools, air compressor, ww fluid, oil, chocolate/granola bars/candles, and flashlight). If I need to remove them, they pop-out as a single unit. In a pinch, one could rest the chassis on them (lots of guys did this with their project cars in the 70s -- those crates are incredibly strong). Price: Ten bucks versus $40 for the Subaru soft-sided start tote (which is very nice, mind you). Bertrn and phgunr like this. Got any pics of what it looks like? I'll take one tomorrow and post it. Here are the pics. 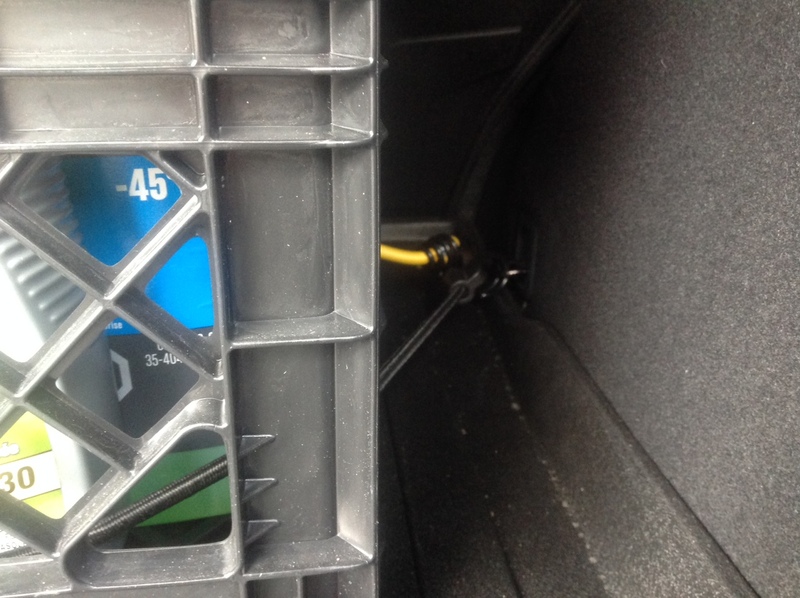 The second one shows how bungie cords/occy straps can be used to keep the milk crates in place. 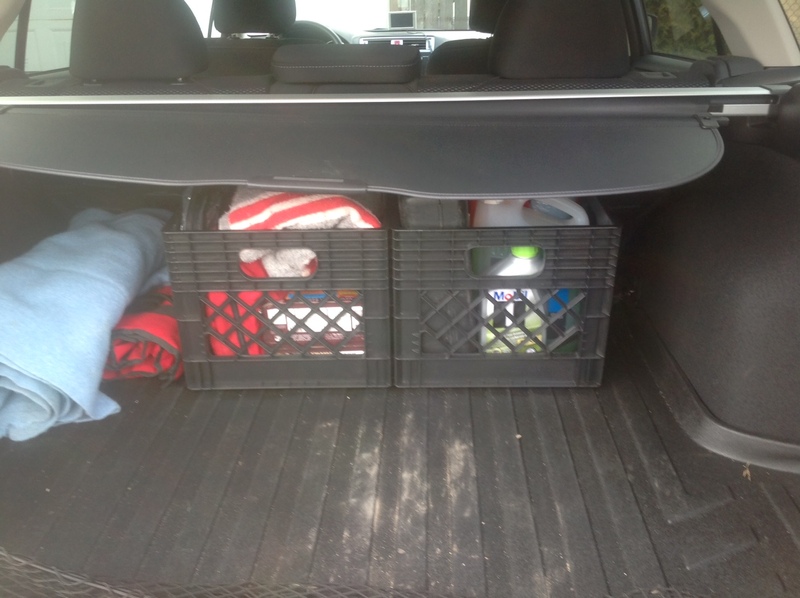 The two crates have the capacity for: FA kit, four litres windshield washer fluid, litre of oil, compressor, light blanket, traffic cones, chocolate & granola bars (in case of breakdown), etc. My tool roll and a heavy wool fire blanket are to the left, held down by the bungee cords. P.S. The crates hold a 20b propane bottle perfectly, which also makes them handy for runs to the refilling station (the crates and cords prevent the bottles from rolling around). Great! You didn't happen to measure whether 3 would fit, did you? From the pics, it looks like it might. Three definitely won't fit. The interior dimensions are about 4 inches too short, though 6 inches wider would realistically be needed to get to the hooks that fasten the bungee cords to the tie-downs. On the plus side, the space that's left with two crates is enough to still have a functional pass-thru for several pairs of skis etc. Maybe you could use skim milk crates instead of whole milk crates? phgunr, Jenkysubielady, SouthernMom and 1 others like this. 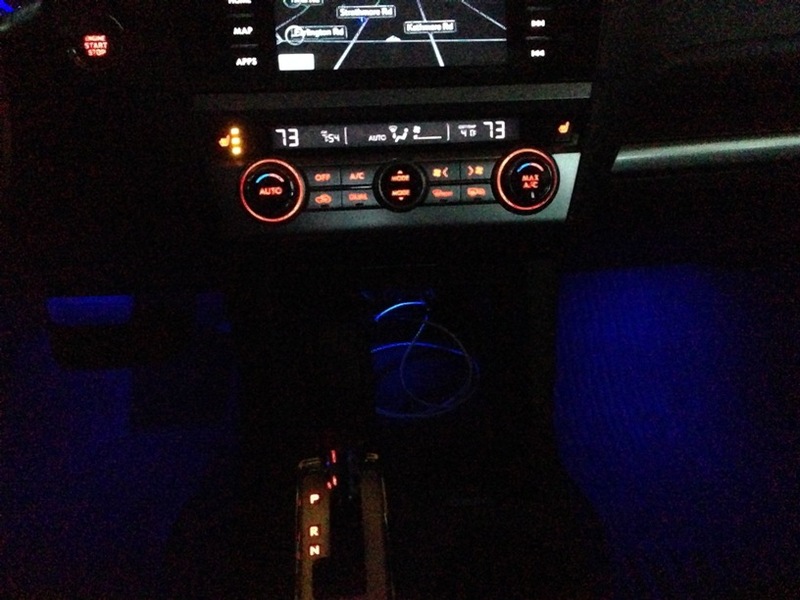 Last weekend I installed footwell lighting. Crappy pic, but it really looks cool in person. The blue matches perfectly as it's a kit for the forester/impreza. Gives the dash a cool floating look, and some extra ambient light at night. 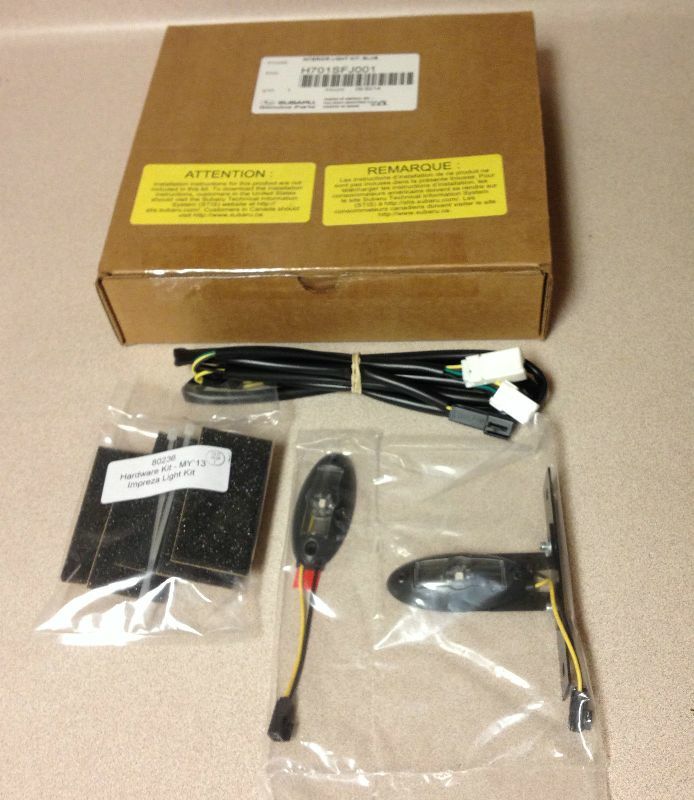 Bought the kit off Ebay for $85 shipped. Took about an hour, popped off vent/hazard assembly with a trim pry tool, snaked the wires down each side of the dash, mounted the lights, hooked into hazards wiring, popped the vent assembly back in....and done. comes on when parking/headlights are on, and dims with interior light dimmer. first mod to the car, looking at other ideas, think I'm hooked. Grimsurfer thanks for the idea of the milk crates. I put some in today. I just got my 15 Outback the Friday before Christmas so I am a newbie. My wife has a 13 CrossTrek, so we are liking Subaru. I do have question to some other post,what is the plasti-dip? It may be very noticeable to all of you, but hey I am new.